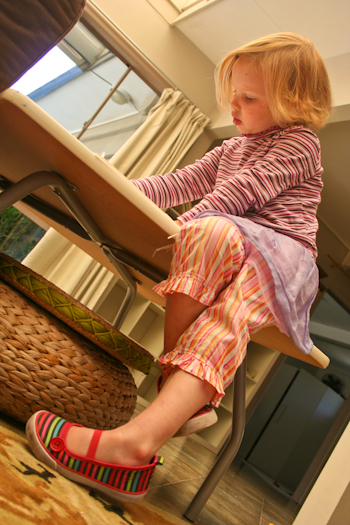 As a mother, I am constantly trying to question our society’s conventions of conformity. As I consciously and unconsciously teach my four girls about beauty, what are the seeds that I am sowing into my daughters’ minds? We’re going out — just to the shops mind you (this isn’t some grand sparkling adventure) — and I’ve instructed the girls to dress in “going out” clothes (as opposed to “digging in the garden” clothes). Four-year-old Brioni emerges, dressed in mismatched stripes three times over. Shoes, pants and shirt — they’re all striped in lollipop colours, but they don’t match. If there’s anything that I like, it’s matching. I feel benevolent in offering her the chance to wear something outrageous from the dress-ups box when leaving the house. Aren’t I an indulgent mother? It was a close call. If God hadn’t prompted me to rethink my philosophy and the implications I was passing onto my children, I would have formed a foundation of insecurity, reliance on physical beauty and obsession with conformity. These things are infamous in teenagers and I suffered greatly from them — a girl with a muscular build, pale skin, freckles and glasses among twig-thin, tanned blondes. 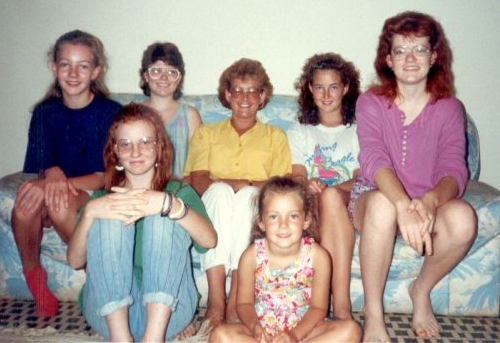 Circa 1990: I'm in the front, with red hair and glasses. The two other girls with glasses are my sisters (we were a family of glasses-wearers), and we were with friends from Northern Ireland. What have I done in passing on our society’s lie that certain colours and patterns can only be worn with other certain colours and patterns? I have stifled my children’s creativity in the expression of their dress and taught them a lie — that their beauty comes from how they look and how they drape themselves with swaths of fabric. Shouldn’t I be focusing on applauding independence of dress instead of insisting they adhere to a code which in its essence is ridiculous and changeable. This conformity to fashion and culture creates a dependence on material wealth that is empty and hollow. Chasing after it doesn’t produce the happiness that we all desire, but a greater discontentment as we strive to purchase more, achieve more, get more, conform more. Perhaps it’s my fundamental weaknesses that I am passing on — perhaps I haven’t fully realised that the truth of relationships are always below the surface. Am I always judging people on how they look or behave instead of stopping and asking questions to discover the real person behind the clothes, what drives them, what their values are, who they love and how they have fun? Or is it about a deeper insecurity? Do I feel more successful as a mother if my children are in matching outfits? If they draw admiring glances from strangers because they’re dressed alike? I’m pondering these things as I stop to admire my happy, un-matching girls and their mismatched outfits. David and I are wondering about the value of mirrors in our lives and thinking about phasing them out. God is teaching me about the beauty of holiness. In the future, there are likely to still be times when I dress my daughters in carefully matching outfits — but I’m going to be careful not to teach them that this is what counts. That “clothes make the man”, that you can “judge a book by its cover”, and the lesson has to start with me. I have to change my heart, model what I want them to know, live the values I want us to share. I know this story so well! The relief when you let go is so freeing. I have two headstrong girls who have known what they wanted to wear from very early days and every now and then I have tried to lets say…‘gently influence’ their decision, but more than often they just won’t have it. I feel blessed with children who are able to stand against my ridiculous fashion expectations (my own wardrobe is nothing to be admired) and make choices that truly come from them. My children attend a Rudolf Steiner school and so have no uniform. I love this. Whilst I don’t agree with the spiritual philosophy of the school (why would you send them, I hear you ask) I love the the educational philosophy and the emphasis on respect and nurturing children. My children are exposed to many different fashions (my eyebrows often want to lift involuntarily) but they learn quickly (as you say) not to ‘judge a book by it’s cover’ and that ‘clothes don’t make the man’. The novelty of what is deemed ‘fashionable’ soon wears off (they are not supposed to wear anything with brand names or too many pictures etc). I have endured many ‘up and down’ looks in my time and this is really hard for someone as sensitive as ‘I’, but in the end I don’t want them to be like me! I want them to be free to express who they are and just glorify our Lord Jesus Christ through being the person he made them to be. So very true. And it’s interesting how perspectives differ: I may have been somewhat twig-thin and even blond back then, but I never felt like I “fit” what I saw as the ICA standard of beauty—which seemed to appreciate short and, um, generous of bosom. I remember very well the first time anyone ever whistled at me in public (which was perhaps a week into my first year at college in the USA). I took an actual Hollywood-style glance over my shoulder to see who was being whistled at, then realized it was ME. It was astonishing to me to discover that being tall and somewhat smaller up top was actually seen as attractive. It’s still taken me years to have confidence in myself, and to learn the truth that beauty lies so much more inward than outward. By the way: I have always coveted your gorgeous hair. I still do. Just so you know. oh yes, its easier said .. I have to make sure my two – particularly Sophie – doesn’t see my disapproving glances at their choice of outfit. If I’m asked for help I’m quick to suggest matching but otherwise I know I should just accept their choices as a reflection of their personality and fully appreciate their independence. Now can you post an article on diagreeable 3 year old boys and how to deal with them?! Well written. I also have learnt to relax when my children get themselves dressed. My only “rule” is that it’s not ripped/stained if we’re going out. I figure that otherwise, if it’s in the wardrobe, then it’s up for grabs. Funnily enough, when I first saw that pic of Brioni (before I read your post) my first thought was “Wow, her girls are always so stylishly dressed! I love Brioni’s outfit! !” LOL! Cesca, I spend very little on my girls clothes (with one notable exception) — they’re all dressed in secondhand clothes from op shops, friends and my darling, generous sister. I have been thinking so much about this lately. I’ve been questioning a lot of the “boundaries” that are set by society lately (I wrote a little about one of them today on my blog), but this thing about beauty has really been on my mind. I’m starting to really desire to understand how to have genuine inner beauty and how to leave behind the way I’ve always tried to measure up on the outside. It’s hard when the natural me (crooked teeth, glasses, crazy curly hair) is not what’s promoted as pretty, but I need to be okay with me and really realize none of my worth comes from my looks. I think it’s wonderful that you desire to teach your girls the truth from the start and spare them a lifetime of believing a lie. Thanks for sharing your thoughts. Great post Lauren. I actually mentioned this recently too – http://ourworldwideclassroom.blogspot.com/2010/07/creative-freedom.html – although certainly not as well as you. However, I feel so blessed that I have been able to let go of my own insecurities in regards to this matter. I look at her with love, pride and admiration….it was however a struggle for me (within) to get to that place. Eeeek! That picture needs to come with a warning! It’s good to let them be themselves. The bad part comes when other children start telling each other that what there wearing is ‘not right’. It’s disheartening when Muffin comes home sad because her ‘friend’ didn’t like her hair, or her shirt etc. I have mixed feelings about this issue. Firstly I have two boys, so the pressure for me (or them) is not there as much in regard to clothing (although, this is changing for boys). On the one hand, no it shouldn’t matter what they wear – in theory it shouldn’t. But there are so many things that we conform to in society – this is just one of them. I’ve seen girls teased for being ‘unusual’ or ‘different’ – sad and wrong as that is, you don’t want your kids to suffer in that way, either. So it’s a tricky one. I am a big believer in letting the child go with their choices. My son doesn’t care if he wears mismatched socks (amongst other things). Someone pointed it out to me at kinder and I said ‘where does it say we have to wear matched socks?’ Well nowhere. Exactly. If he doesn’t have a problem then neither should you. I’m glad you let her wear the stripes. I think they go together quite well :) My parents were and still are quite intent on ‘keeping up appearances’. As an only child I was dressed as a clone of my mum everyday, right down to the blow dried and teased 80’s hair, even as a 5 year old. Now I love nothing more than going against the grain of society. This extends to more than just dressing. I thrive on non-confomrity in every aspect of my life. Sure I still get the guilt feeling when I don’t ‘measure up’, and hate to be a dissappointment, but at the end of the day I get such a thrill out of doing it my way. I love to let my girls pick their own clothes and I don’t have a problem letting them wear whatever they want out, however, my husband is quite picky. He greatly dislikes odd socks and will often say “Is that what she wearing?” but I know what it was like to forever worry about my looks and I don’t want that for my girls. They are beautiful however they’re dressed. My biggest problem with clothing for my 2 girls is finding age appropriate clothes. I love your take on it, and the stripes look cute. I think she looks gorgeous in her stripes, but I probably would have done the same…and had to check myself. I try and let Will choose what he wants to wear, and only step in if its something impractical for the weather. As a children’s clothing designer though, I find it hard sometimes! Rather like your first commenter, Lynda, I have a daughter who would smile at me pitiously and insistently keep her mismatched clothes in place even if I did suggest (sometimes I have, mostly due to weather restrictions!). I loved this post of yours. Even let out an audible “Awwww!” and had tears spring into my eyes when you called Brioni back and apologised and explained why. That right there… that is the stuff that grows good people. Lovely! As a young girl, you were def the prettiest of the bunch!! It is amazing how we battle to see ourselves as beautiful.